I did not know what it was called the first time I had it. I was at a b'day party and a huge piece of cake sat in front of me waiting to be eaten. I almost swore that I would have just a tiny little piece. And thank God that I only almost swore, because OMG, I just bit into super-tasty, ultra moist goodness with sweetened milk syrup oozing out of it leaving a delightful, lingering after taste that made me wonder if I tasted heaven. I complimented the host on the amazing find. And then I forgot about it. Until... I had it again, at another party. So I tasted heaven, again! And that's when I decided, I had to make this cake at home! Tres Leches is the name - stands for 'three milk'. It's a Mexican dessert, with three forms of milk working hand in hand to give you a a perfect balance of sponginess and sogginess. I googled for the recipe, and out of all the different ones I found, I chose this one. Preheat oven to 350ºF. Grease a 9"X13" baking dish. Combine flour and baking powder and keep aside. In a large bowl, with an electric hand mixer, beat butter and sugar until creamy. Add eggs one at a time and beat. Add vanilla and beat further. To this add the flour mixture little by little and beat at a low speed till it mixes well. Pour into baking pan. Bake for 30 mts or until fork inserted comes out clean. Combine the 3 milks in a large mug. Poke the cake with a fork several times and pour the milk all over the cake. Refrigerate. Whip cream, sugar and vanilla on medium for 5 to 7 minutes. (don't overwhip). Top the cake. Decorate with cherries (optional). The butter-sugar-eggs are working their magic. Here's the cake ready to be poked. A hundred times! Poke poke poke. Keep on poking. You want the magical concoction to seep right into the cake till it cries out of intoxication! And the syrups get ready for their selfless mission of filling the sponge with all the goodness. Don't worry, it's a sponge. It will absorb all the liquid. The best bet is to refrigerate it for a few hours. And when you take it out, you will not see any trace of the liquid on the surface. Also, the middle of the cake absorbs a lot more than the sides and will be soggier, so feel free to scrape off a little bit of the sides (which can serve as a yummy snack while topping the cake). And if given a choice, go for the middle pieces :D.
Here's the cream getting whipped. And here's the the Tres Leches cake, all dressed up and decked with Maraschino cherries and rouged with pink whipped cream. Now, isn't that a pretty lass? Update : I feel fresh strawberries make a tastier adornment. So just chop some strawberries and decorate the cake with it. 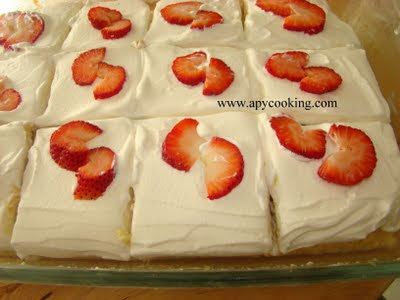 You can actually cut the cake into smaller portions and top each one with a strawberry. And don't worry if you can't. The cake tastes great on it's own. Hi Harsha, thnx! Sure, amchigele recipes will come up soon. Hey Aparna.. Nice blog! Tres Leches and the basket weave cake look great. I just noticed, you and I have started blogging on the exact same date! :) Best wishes! Good to see you started blogging food. Your cakes look pretty. So this is the tres leches cake. Lovely! Sure, wud luv an opportunity to make something fr u.
thnx! i finally joined the pool! Can I try this for the egg-less cake recipe?